On our way to Canyon de Chelly National Monument, in northeast Arizona, I call ahead to the visitors’ center to ask about a Navajo guide who can accompany us into the canyon for several days. With a high-clearance, four-wheel-drive vehicle we can safely manage most of the roadless sand track, but leaving the rim and driving into the canyon requires the services of a guide from the Navajo nation. This is the best way to experience the park and more deeply understand its people and its past. Canyon de Chelly is the convergence of two ancient canyons, estimated to be perhaps thirty million years old. The walls of the canyons are dusky dark red and 1,000 or more feet high. 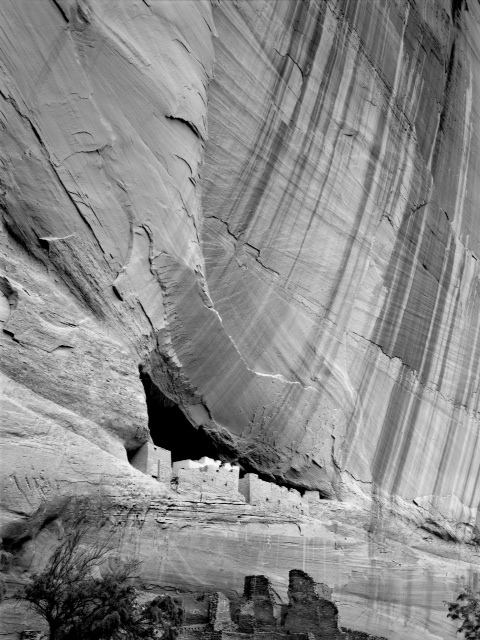 The dwellings of the people who finally came to be known as the Dine’ or Navajo are tucked high into the rock formations, into the layers of geological time. The canyon is one of the most exquisite places in the whole of the American Southwest: dramatic, evocative and still alive with Navajo culture, even if it takes a little work to find it. It turns out that Deborah is not a guide, but wants to be. 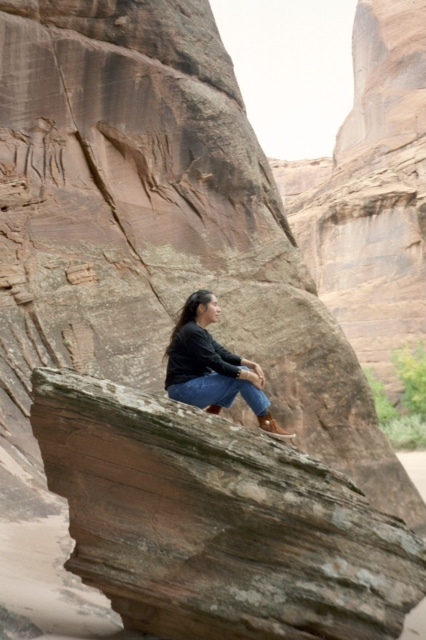 What Deborah is, is better than a certified guide: She is a young Navajo woman born and raised in her hogan a few miles from the canyon, a woman who still visits her grandmother’s land on the canyon floor to help harvest corn, squash and watermelon. The guidebooks call a certain trail “tunnel trail.” Deborah says everybody knows it is “sheep trail.” The guidebooks talk about a high water table in the canyon. Deborah says she used to dig a hole a foot deep to get her own water when she was thirsty. 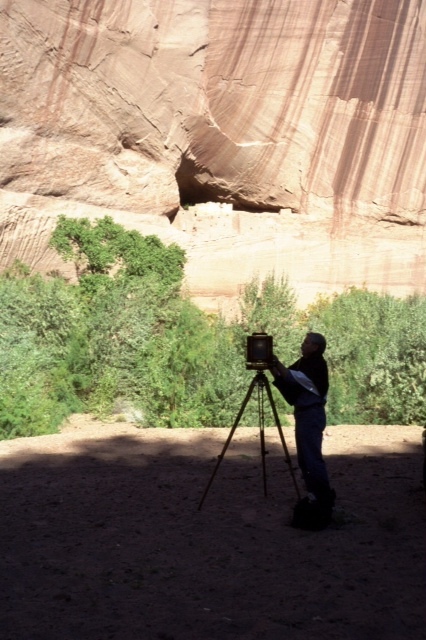 She knows that the pictographs at Antelope House were made later by a man the Navajos call “Mr. Little Lamb.” She is the perfect guide for us. Deborah has strong Indian features and a mane of black hair that falls down her back. She stands proudly and moves like a cat. In the days that follow, we learn that her real name is Esstaish, meaning soft lady, a name given to her by her father. 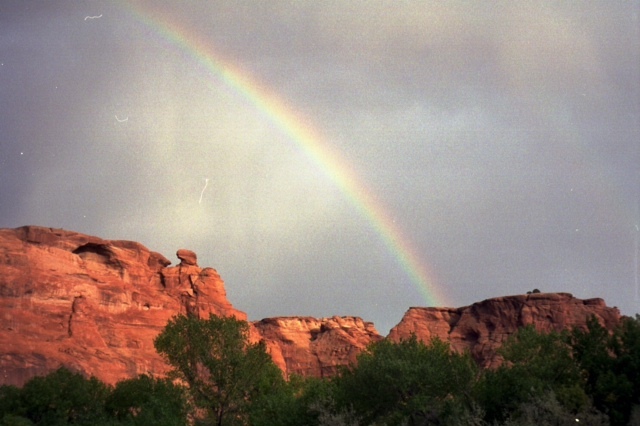 All Navajos identify themselves by the clan they are born into and the clan they are born from. Deborah says she is from the Coyote Pass People to the Mexican Water People. There are about 130 different clans now, all derived from four original ones. While Patrick is photographing, Deborah teaches me about the Navajo language and the old, almost-forgotten words. She tells me there is a single word for those who travel in groups, another for they came again into being. There is a word for to where he has never been and one for because there are bodies of water there. One word, nizhi, means someone’s name, voice and body–I guess, in a way, nizhi is the totality of that person. There is a particular rock face that Patrick loves, and now he stands studying it. He takes in the sky and the gathering clouds; there is not enough light to get the photograph he wants. Hawks ride thermals high above the canyon floor and the wind howls. Deborah is sitting in the sand eating pumpkin seeds, her cascade of black hair lifted on the ends by the wind. Soon we hear heavy thunder and see the electric white jag of lightning. The clouds are moving in opposite directions; the top layer moves east to west, and the layer beneath it, heavy with black rain, moves west to east. Sometimes the clouds break apart for a few seconds and we see sun and a light sky behind them. In those moments, the rock face glows with an unearthly light. Deborah says she will name this rock Patience Rock. Says the rock is a she.